The Torque Wing is installed on the engine side of your carburetor slide. 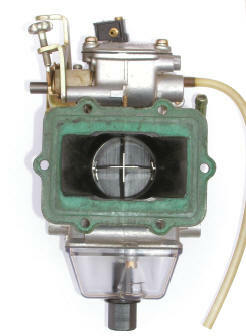 This divides the carburetor bore into four quadrants, utilizing a horizontal and vertical air ﬂow stabilizer. The premise here is to eliminate air turbulence and straighten out some of the air ﬂow and acoustical waves traveling back and forth through the carb’s venturi, thereby increasing air ﬂow, air speed, fuel atomization and throttle response. All engines, whether two-stroke or four-stroke, have naturally occurring reversionary pulse waves in the intake tract that are very turbulent. 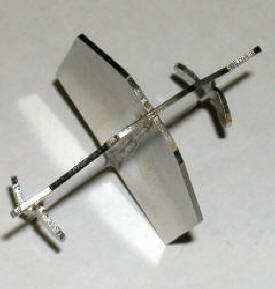 The Torque Wing helps to eliminate this turbulence for another rapid return trip to the engine. it is much smaller. The horizontal stabilizer prevents this drop in air velocity, producing much quicker throttle response and a substantial increase in torque. Think of it like this – we know the air speed in a set of 33mm carbs is much faster, and thus the throttle response is far quicker and snappier than with a set of 40 mm carbs. 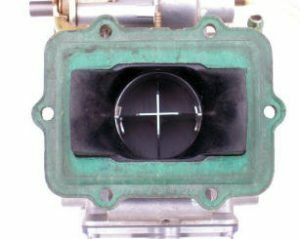 As you open the throttle slide, having the horizontal divider makes the big carb act like a smaller one, so the airspeed is faster and the throttle response is just like you have a set of small carbs on the engine. Throttle response is extremely quick and the Torque Wing continues to kill off multi-directional turbulence all the way through full throttle. 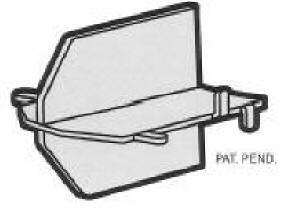 The Torque Wing has been designed to protrude out past the end of the carburetor and into the intake manifold. This holds the air column together longer preventing the break-up which creates turbulence. In most reed valve engines, the air column is held together all the way to the reed valve. Installation is fairly easy and no carb tuning is required. Pull the carbs from their mounting boots and install the Torque Wings into the carb bore on the engine side. The Torque Wing utilizes four locating tabs giving you a perfect fit in every carburetor. The two inner tabs are locating tabs that contour to the throat of the carb bore, and the two front tabs lock it into the rubber intake boot and are used to prevent the Torque Wing from twisting. Constructed from stainless steel, it won’t rust, corrode or be affected by any fuel or additives. Install it and enjoy the power. One of the applications where it seems to work well is with the sleds that suffer from the erratic high idle. You know, the ones where you come to a stop and the sled sits there and idles really high? The Torque Wing does a good job at knocking this high idle down. Regardless of which intake system you have, reed valve, piston port or rotary valve, the Torque Wing will produce impressive results in seamless power across the rpm range making your machine faster and easier to ride. Torque Wings retail for $74.95 each and are available for most popular small engine carburetors from Mikuni VM round slide and TM flat slide carbs to Keihin PWK carbs. Contact Thunder Products, Inc. at 320-597-2700 or see their website at www.thunderproducts.com.